This Natures Window photograph is a personal favourite of mine. This iconic Australian scene is truly beautiful and is one I love to visit. 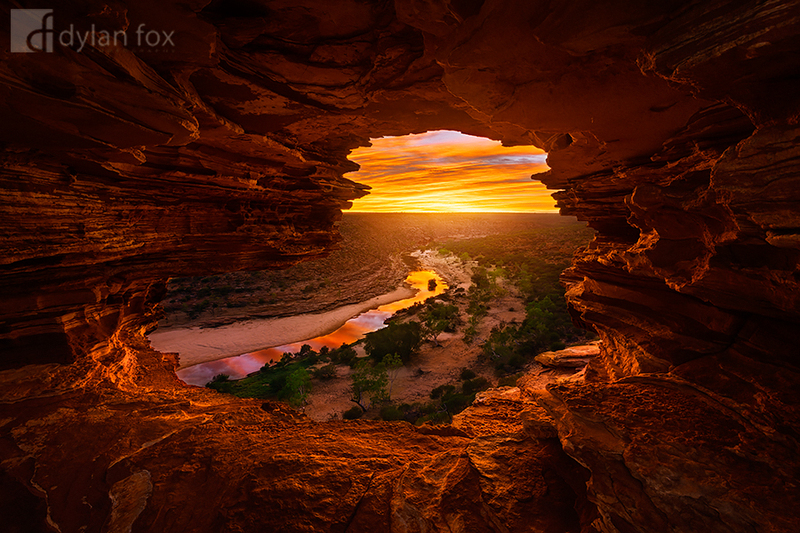 I had waited the better part of a year to photograph Nature's Window in Kalbarri National Park. I needed the right time of year so the sunrise would line up with the view through the window, overlooking the Murchison River as it curves it's way around 'the loop'. The first sunrise didn't yield any results with not a cloud to be seen. However when I woke up at 4am to see some clouds out to the east I started to get excited. As I was driving over the corrugated dirt road into the park I could see the colours starting to appear at first light. At this point I was confident I might be about to witness something special. I composed my shot and didn't have to wait long for the scene to erupt in colour! One of the best sunrises I have seen in a long time and I couldn't have been more thrilled to be at a place to spectacular with my camera equipment. The two days prior had been incredibly windy. This morning however there wasn't a breathe of wind, leaving the trees in the gorge completely still. I am thrilled to have got conditions far better than I could have even asked for! Nature's Window and the rest of Kalbarri is just spectacular. While capturing this photograph I could see two swans in the river and had already seen a couple of Kangaroos. This Natures Window photograph will always be special to me and a moment I will never forget! Secure your limited edition, Natures Window print, 'Cherish These Moments', by selecting your desired print size in the menu to the right.